The Plummer family has launched Heading Home’s Annual Giving Campaign by generously pledging $16,000 to match $32,000 in new gifts over the next three months. 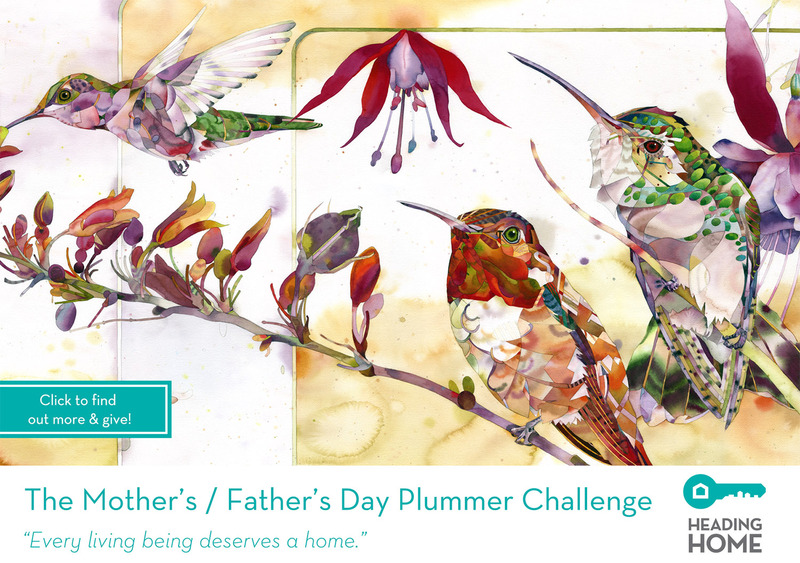 If you give or pledge to Heading Home’s mission between now and the end of June, every dollar you give will be increased by the Plummer Family Challenge by an additional 50%. When you make your gift, you will receive BOTH a Mother’s Day card and a Father’s Day which will say that a gift has been made in the recipient’s honor to fund Heading Home’s work to shelter and house people experiencing homelessness in Albuquerque. Click here to read more. Or CLICK HERE TO GIVE NOW! If you’d rather pledge a future gift, please contact Heading Home Advancement Director Charles LaFond at (505) 344-2323 x 203 or (693) 344-2711, or email at CharlesL@headinghome.org. Heading Home programs have collectively transitioned more than 3,000 individuals into housing since 2011. Read more about our programs here. Thank you to the wonderful folks from Bell Bank who volunteered to serve our housed clients at our monthly Peer-to-Peer Luncheon! A new report that analyzes the initial outcomes of Heading Home’s street outreach program has been released and the results are very promising! There’s been lots of conversation in the media lately regarding homelessness in Albuquerque and governmental initiatives to address it. Below are some stories that will fill you in on this ongoing dialogue with municipal and state governments, service providers and the public at large. Thanks to the wonderful young leaders from Aims Community College in Greeley, Colorado for choosing Heading Home for their Alternative Spring Break! Thanks to the New Mexico Coalition to End Homelessness (NMCEH) for organizing homeless service providers in engaging their representatives at the 2019 legislative session. Annually, NMCEH leads volunteers and service providers in dialoguing with legislators about systemic needs for addressing homelessness statewide. January saw huge engagement from supporting organizations and businesses in the community. Heading Home thanks Walgreens, Nusenda and the Doug and Duran morning show on Magic 99.5 FM for investing in Heading Home. A resident at the Albuquerque Opportunity Center’s 24-hour respite program got more than a new outlook at the start of this new year – he got housing! We know that the solution to homelessness is housing. With your support, together we can help save lives and money by housing people experiencing homelessness who are the most likely to die on our streets and are utilizing the most amount of services. We can shut the door on homelessness, making it a thing of the past and making a future of permanent housing and hope. We will act in ways that establish credibility and mutual trust. We meet people we serve where they are. Everyone who wants housing should have access to housing. We promote justice tempered with compassion. Err on the side of graciousness. We are committed to providing non-threatening, safe spaces for everyone we serve, wherever they are in the community. We expand choices and remove barriers to such access, so that housing is safe, affordable and accessible. To stay up-to-date on the progress of our mission, ways to get involved and issues relating to homelessness, please sign up below for our monthly e-newsletter. With your support we are making homelessness rare, short-lived and non-recurring in our community!